This flavorful steamed chicken sticky rice features soft-chewy sticky rice, chicken, shiitake mushrooms and sweet sausages (lap cheong). 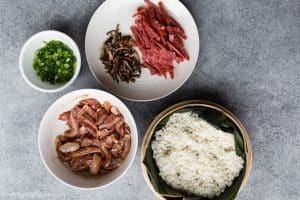 Everything is cooked together in a bamboo steamer and then served with popular toppings for savory sticky rice. 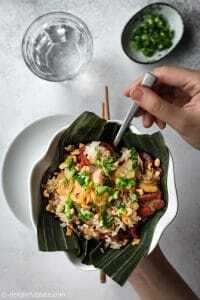 The original version of this dish is Southern Vietnamese savory sticky rice (xoi man). Xoi man also contains chicken and Chinese sausages but they are cooked separately from the sticky rice. I thought why not cook them together to let the rice soak up the seasoning and flavors from the chicken and sausages? It will also simplify the cooking process a lot. So I gave it a try yesterday, and the dish came out flavorful and delicious, beyond my expectation. Vietnamese people often eat sticky rice for breakfast, but there are also a lot of sticky rice shops that are open from morning to evening. 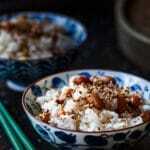 You can certainly eat this chicken sticky rice for any meals. (unimportant extra information: yesterday was Mr. Delightful Plate’s birthday and he requested sticky rice for his birthday dinner). 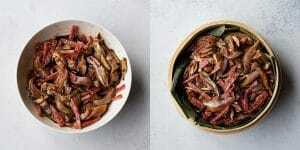 To make this dish, you’ll need sticky rice, chicken, dried shiitake mushrooms and Chinese sausages. I strongly recommend using short-grain sticky rice which is softer than the long-grain counterpart. I bought my pack of short-grain sticky rice at a Korean grocery store. Please note that sticky rice can also be labeled as glutinous rice or sweet rice. You can find Chinese sausages at a lot of Asian grocery stores. Vietnamese people love eating sticky rice with this sausage. Dried shiitake mushrooms are also available at Asian grocery stores. Other ingredients include fried shallots, roasted peanuts, scallions and a piece of banana leaf to line the steamer. 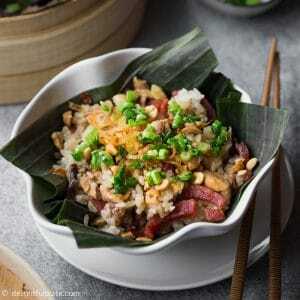 Another favorite sticky rice topping of Vietnamese people is meat floss (ruoc) such as pork floss and shrimp floss. We don’t need it for this recipe, but you can certainly add it if you have some on hand. are some of the places that sell this kind of steamer. Step-by-step instructions and photos are in the recipe card as usual :). Soak sticky rice in plenty of water for 4-6 hours or overnight. When you start the cooking process, rinse the rice under water and put it in a colander to drain. Set aside. Pour plenty of boiling water over dried shiitake mushrooms. Set aside to let them rehydrate for 5-7 minutes. Slice chicken thighs into thin strips. Marinate with soy sauce, oyster sauce, 1/4 teaspoon salt, grated garlic and black pepper. Wash and pat dry the piece of banana leaf and use it to line the steamer. Mix sticky rice with 1/2 teaspoon of salt and then pour it into the steamer on top of the banana leaf. Mix chicken, sausage and shiitake mushroom together and place them evenly on top of the rice. Steam everything for 16-20 minutes until the rice is soft and chicken is fully cooked. Immediately place a small saucepan over medium heat and add the olive oil. 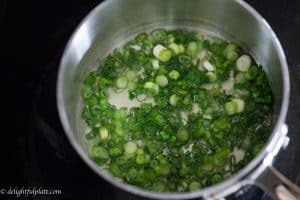 When the oil is hot, add the scallions and stir and cook for 30 seconds. Turn off the heat. Transfer sticky rice to serving bowls. Top with roasted peanuts, fried shallots and the scallions oil mixture. Serve hot. 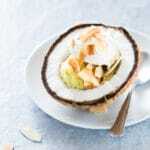 Hi Sophie.. what a great straight forward recipe! Glutinous rice always seem much stickier than short grain rice. Would the cooking formula and results be the same if I used glutinous rice? I’m surprised not a single drop of water is used for steaming the rice and it’s cook in 20 minutes! Maybe that’s why my glutinous rice always seem a little on the wet side!! Thanks for visiting me here and leaving me a comment! 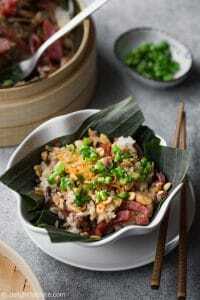 Great to see you here in addition to Instagram :D. This recipe does use sticky rice (also called glutinous rice) and I prefer short-grain sticky/glutinous rice. Southeast Asian countries seem to use mostly long-grain glutinous rice while short-grain glutinous rice seems to be much more popular in Japan and Korea. Sorry if my post confused you! Please let me know if this isn’t clear enough. Would you be able to convert this to instant pot times? I have never made this dish in the Instant Pot. If you have cooked sticky rice in the Instant Pot before, you can use the Instant Pot to cook the plain sticky rice separately. Then sauté all other ingredients on the stovetop and place them on top of the cooked sticky rice. That’s the easiest way I can think of at this moment. If you give it a try, I look forward to hearing how it turns out.